Hemochromatosis - A disorder caused by deposition of hemosiderin in the parenchymal cells, causing tissue damage and dysfunction of the liver, pancreas, heart, and pituitary; also called iron overload disease. Hemosiderin - An intracellular storage form of iron, the granules consisting of an ill-defined complex of ferric hydroxides, polysaccharides, and proteins having an iron content of about 33% by weight. Hemosiderosis - A focus or general increase in tissue iron stores without associated tissue damage; hepatic and pulmonary hemosiderosis being characterized by abnormal quantities of hemosiderin in the liver and lungs, respectively. Zinc Protoporphyrin (ZPP) - A normal but minor product of the heme pathway in the red blood cell that becomes elevated when insufficient Fe (II) is available to the developing erythrocyte. Anemia can be caused by a variety of mechanisms and proper treatment depends on successful identification of the etiology of the anemia. A complete blood count (CBC) provides essential information for the diagnosis and treatment of a variety of hematological disorders. Consequently a basic understanding of the hemogram is important for diagnostic and treatment purposes. Iron, B12, and folate status are also important in hematology and a variety of disease states. The laboratory plays a key role in the diagnosis and treatment of both B12 and iron deficiency as well as iron-overload states. The incidence of iron deficiency is about 9% in toddlers, 2% in men, 11% in menstruating women, and nearly 50% in pregnant women. The cause in children is frequently dietary deficiency; e.g., milk has a very low content of iron. In adults, the cause is generally chronic blood loss. Hemosiderosis implies iron overload without tissue injury. Hemochromatosis is a condition of iron overload with associated tissue injury. It is usually caused by chronic, excessive absorption of iron. Hereditary hemochromatosis is the classic disorder of iron overload. The prevalence of homozygosity is about 5 per 1,000. In all three conditions, serum iron, iron saturation of transferrin, and ferritin are high. Transferrin and TIBC are usually low in hemochromatosis. Serum iron is defined as Fe (III) bound to transferrin and to a much lesser extent to some other serum proteins. Iron bound to free hemoglobin is not included. Decreases in serum iron are seen in iron deficiency and in chronic inflammatory disorders. 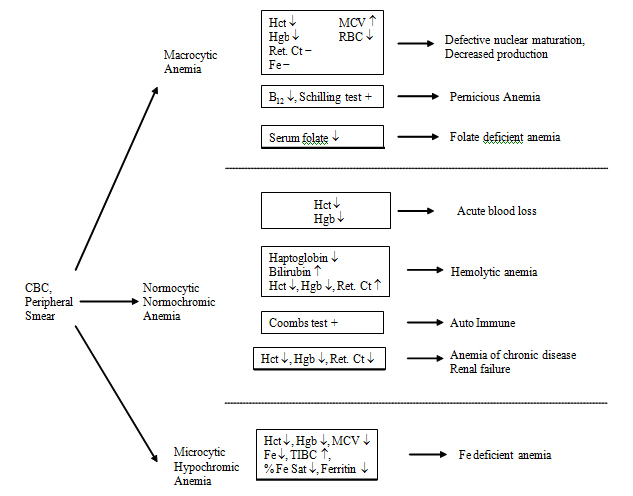 Serum iron may also be decreased in the early stages of treatment for anemias, e.g. the treatment of pernicious anemia with vitamin B12. In this case, hemoglobin synthesis draws iron from serum and iron stores. Other causes of low serum iron are hemorrhage, blood donation, and menstruation. Increases in serum iron are seen after use of oral contraceptives (increased synthesis of transferrin), in iron overload conditions such as hemosiderosis and hemochromatosis, acute iron poisoning, ingestion of iron medication (300 mg tablet of FeSO4 raises serum iron by 300-500 µg/dL), parenteral iron administration, and hepatitis (release of iron from liver iron stores). Definition: measurement of the maximum amount of iron that serum proteins, mainly transferrin, can bind. The TIBC is increased in iron deficiency. The combination of low serum iron and increased TIBC is helpful in the diagnosis of iron deficiency. TIBC and transferrin are decreased in acute inflammation (transferrin = negative acute phase reactant), in chronic inflammatory disorders (decreased transferrin synthesis), in malignancies, and in malnutrition. The percent saturation of transferrin is an additional diagnostic tool. Normal values are 20-50% in males, and 15-50% in females. It is low in iron deficiency and high in hemochromatosis. In the latter condition, total transferrin and TIBC are frequently low. The portion of transferrin that is not saturated with iron is called apotransferrin or unsaturated iron binding capacity (UIBC). Ferritin is the chief iron storage form in the body. Serum ferritin is very low (about 1% of total serum iron) and is in equilibrium with the body iron stores. In ferritin, iron is present as micelles of hydrated ferric oxide-phosphate complexes, adhering to the inner surface. Ferritin is a very sensitive indicator of iron status, especially for iron deficiency except in chronic inflammatory disorders like rheumatoid arthritis, renal disease, and malignancies (predominantly lymphomas, leukemia, breast cancer, and neuroblastoma) in which ferritin is increased. High serum ferritin values are also seen in viral hepatitis (release from iron stores) and in iron storage diseases. This is a screening test, mainly used in pediatric practice to detect iron deficiency and lead poisoning. In both conditions the last step in heme synthesis is prevented; in the first case by lack of iron, and in the second case by inhibition in the presence of lead. Thus, heme precursors, principally protoporphyrin IX, accumulate. Increases are also seen in rare erythropoietic porphyria and erythropoietic protoporphyria. 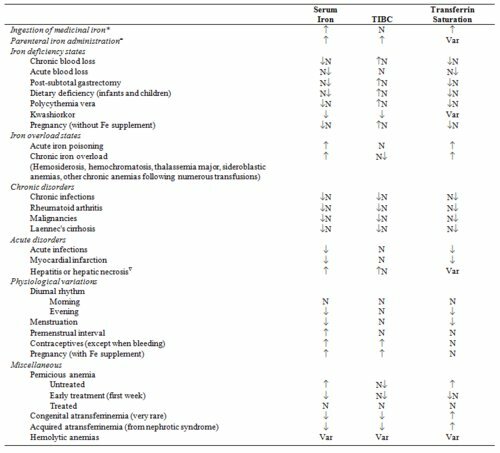 Thalassemic disorders have normal FEP. Measurement of iron in liver biopsies is also very helpful in the diagnosis of hemochromatosis, especially in cases in which the serum iron and iron-binding capacity may be borderline abnormal. Taken from Fairbanks, V.F., and Klee, G.G., Chapter 15, Biochemical Aspects of Hematology, In: Textbook of Clinical Chemistry, N.W. Tietz (editor) W.B. Saunders Company, 1986, pp 1577-1584. For each entry in this table, the most characteristic change is indicated first. ↓ = decreased concentration. ↑ = increased concentration. N = normal results. Var = variable results. * The ingestion of a single tablet or capsule of an iron-containing medicinal can raise the serum iron concentration by 300-500 µg/dL, an effect that often masks iron deficiency. Peak serum iron concentration occurs a few hours after ingestion; the effect is most pronounced in iron-deficient subjects. - Increased serum iron concentration may be observed for weeks following an injection of iron dextran. The mechanism of this has not been determined; most likely it reflects iron dextran in plasma. The increase in TIBC characteristically observed with automated methods probably does not reflect increased transferrin but a methodological artifact (additional release of iron from iron dextran as a result of the procedure? ), since the unsaturated iron binding capacity is normal in this situation. vIncreased serum iron concentration is the result of extreme hyperferritinemia consequent to hepatocellular injury. The increase in TIBC characteristically observed with automated methods probably does not reflect increased transferrin but a methodological artifact (additional iron release from ferritin as a result of the procedure?). An 82-year-old man, weighing 54 kg and 168 cm in height, presented to the emergency department (ED) with symptoms of jaundice, fatigue, dizziness, loss of vision, and shortness of breath. Vital signs on admission revealed T 36.7°C, HR 66 beats/min, and BP 96/46 mmHg. The patient’s calculated creatinine clearance was 48 mL/min. His chronic medical conditions included hypertension and coronary artery disease. He had been prescribed a 10-day course of levofloxacin (500 mg/day) for cellulitis subsequent to injuries to his leg. Approximately 4 days after levofloxacin initiation, the man noticed symptoms of fatigue and dizziness. By the end of the 10-day treatment with levofloxacin, the symptoms had progressed and included jaundice, severe fatigue, Coca-Cola-colored urine, loss of vision, and shortness of breath. On admission to the ED, blood work revealed hemoglobin 7.0 g/dL, hematocrit 19%, lactate dehydrogenase (LDH) 1543 IU/L, and unconjugated (indirect) bilirubin 4.8 mg/dL. Electrolytes and liver enzyme tests were within normal limits. Is this type of adverse drug event common for this drug? This class of drugs? What other laboratory tests might be useful? Patient presents to clinic because he ran out of atenolol. PMH includes hypertension, hyperlipidemia, impaired fasting glucose, and microcytic anemia. Routine labs include TIBC 585 ug/dL (normal 228-428), transferrin 418 mg/dL (normal 200-400), Fe 11 ug/dL, ferritin 5 ng/mL (normal 30-400). What is this patient’s % iron binding saturation? Is it consistent with the rest of his clinical picture? How would you classify this patient’s iron status? What kinds of drugs could cause these findings? What pathological conditions could cause these findings? What other laboratory tests might be indicated? A 56 year old white male presented with abdominal and ankle swelling of several months duration. The patient was well-developed, looked tanned even though it was winter, and had normal vital signs. His abdomen was protuberant with a fluid wave. There was no palpable liver edge. Laboratory data showed normal values for Hb and leukocyte count, normal electrolytes, no blood ethanol, a marginally elevated bilirubin, slightly elevated AST and ALT, and a cholesterol of 182 mg/dL. The total serum iron was 316 µg/dL (normal: 65-170); transferrin 218 mg/dL (187-318); transferrin saturation, 95% (20-50%), and ferritin 2542 ng/mL (20-250). Is there any significance to the fact that the patient looked well tanned? What values would you expect for TIBC? Brethren, I want to tell how doctor ehidiamen did his work in my life; I was diagnosed of hemochromatosis long time ago, and my iron level was very abnormal. i was having joint pain, fatigue, general weakness, weight loss, and stomach pain. My ferritin rose to 655; i drank a lot of tea, and mild to help bring down my iron level in other to reduce my ferrtin. Also some drugs were administered, but at a time it reduces it, and at another time it goes up. It became worse that i became diabetic. My condition was becoming worse by the day that i had to start trying all i could lay my hands on just to get even better, but none worked for me. i followed my cousin to hospital where she went for her dialysis because she was having kidney problem, so the doctor said we have to arrange money to fly her to India for transplant. And the other doctor said to his colleague that he is very surprised how a herbal man surprisingly cured his cousin of a brain disorder disease called CJD. i was shocked to hear that a brain disease could be cured by herbs and roots, and this gave me the interest go to close to the doctor to ask more questions about herbal remedy he just talked about. He explained to me and told me that his cousin had to ship herbs from a herbal doctor called EHIDIAMEN EHIMEN to get his cure. So i became more interested and wanted to meet with his cousin so that i have more insight on how he was cured of CJD using herbs but could not get to him because he leaves in other country as at the time i had meant with his doctor cousin. But i was given the contact details of the herbal doctor who cured him, so i contacted him, and told him if he had heard of hemochromatosis but he told me the short form was HH and he explained deeply about HH and i was impressed when he said he could help me with herbs that can make me okay. So i built my confidence in him, and he stood by his words to send me herbs. We made all plans and he prepared herbs and send to me. i took his herbs and i was so amazed the way i was responding to it in just 8 days i started taking it. i took it until i completed the dosage as directed by him, brethren behold this herbs i talk about cured me of my hemochromatosis and today i am cured of my hemochromatosis and also my diabetes. I don't know how to say this further anymore because i am so overwhelmed that i am now free and cured of hemochromatosis. Please i come here to tell all still having this disease that there is now a hope for you to be cured of it through the help of herbal doctor EHIDIAMEN EHIMEN with the use of his herbs and roots. i implore you all to take his contact now, and contact him immediately so as to be free from this disease just as i am now. His email is (moc.liamg|nemaidiherotcod#moc.liamg|nemaidiherotcod), Tel. No: (+2348102802949).